The owner of Dana Transport Inc. accused PNC Bank, Wells Fargo & Co. and others of costing him more than $500 million with a scheme that thrust the trucking company into default on a loan even though it was current on payments, according to a racketeering suit filed in New York on Thursday. Ron Dana, the “rags to riches” millionaire who started one of the nation’s biggest transportation companies when he was 18 years old, said lenders worked in tandem with consultants and other companies to force Dana Transport into default on a debt facility it was still making payments on, costing millions and putting the business in jeopardy, according to Thursday’s complaint. The 98-­page complaint includes claims of conversion, breach of contract and Racketeer Influenced and Corrupt Organizations Act violations. According to the suit, PNC, Wells Fargo, Huntington National Bank, and a handful of others received millions for pushing Dana into default. Dana Transport estimates it paid over $100 million in default interest, late fees — even though it wasn’t late — legal fees, bank charges and more, the suit said. In addition, the trucking company said it suffered $500 million in damages from other lost opportunities, including not being able to borrow new loans while handling its falsely defaulted loan, according to the suit. The suit said Dana Transport had taken out a $135 million loan facility, including a revolver and a syndicated loan, in 2006 from PNC, with which the company had a banking relationship. But in 2007, a consulting company, Taylor & Martin Inc., assessed the collateral backing the debt at $14 million less than the required position, according to the suit. PNC had instructed the consultant to lowball the collateral, Dana said. The bank then demanded a personal guaranty from Ron Dana to keep the money flowing, which the company needed to continue operating, according to the suit. “This tactic of securing the personal guaranty of Ron Dana by stating Dana would not be funded the following business day if the personal guaranty was not executed was the first of a series of events that were to become a pattern of using extortionist tactics in administering the loan, charging Dana exorbitant fees and taking more than the lenders were entitled to,” the company said. The complaint alleges a systematic and coordinated effort to draw extra late payments, fees and funds out of Dana Transport by pushing its debt into technical default, pouring money into the defendants’ coffers and draining Dana while it was successful, according to the filing. Representatives for PNC, Wells Fargo and Huntington Bank declined to comment. Representatives for the other defendants didn’t immediately respond to requests for comment on Thursday. 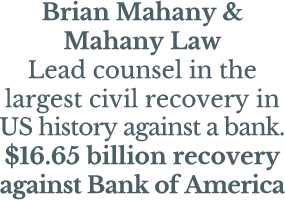 Dana is represented by Brian H. Mahany of Mahany Law and Michael M. Steinmetz of Garson Segal Steinmetz Fladgate LLP. Counsel information for the defendants couldn’t be immediately determined. The case is Dana Transport Inc. et al. v. PNC Bank et al., case number 1:15­cv­07954, in the U.S. District Court for the Southern District of New York.